The original PowerPC 603 was released way back in 1994, made on a 0.5u process and running at 75MHz. A year later, the greatly improved PowerPC 603e was released, made on the same process, but supporting speeds of up to 200MHz. It doubled the L1 caches to 16K each (for Instruction and Data) and introduced some Power Down modes useful for mobile and other low power applications. A die shrink to 0.5u allowed speeds of up to 300MHz. Chip Supply Inc. was founded back in 1978 in Orlando, FL just for this purpose. Chip Supply provided die testing and packaging services for many different companies. They also provided a service known as ‘die banking’ and just as the name implies, this involves collection and storing wafers and/or dies for future use. This helped with end-of-life products especially. As manufacturers slowed, changed, or stopped production of a device, dies for it could be made available through firms like Chip Supply. 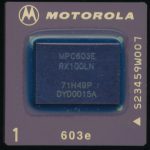 In 1997 Chip Supply Inc. signed an agreement with Motorola giving them access to bare dies and known good dies for the PowerPC 603e, MPC106/7 PCI Bridge, and the MC68000 line. This allowed Chip Supply to source dies from Motorola, screen them for higher spec (Military and Industrial temp typically). Motorola had a similar agreement with Thomson-CSF (later this line was acquired by Atmel) who did the same thing, but also made radiation tested parts for space use (notably used on the original Iridium satellite constellation). The CS603RMP-200 is a 200MHz PowerPC 603r processor. The 603r is nearly identical to the 603e, but allows for lower voltages (2.5V) and is made on a 0.29u process. 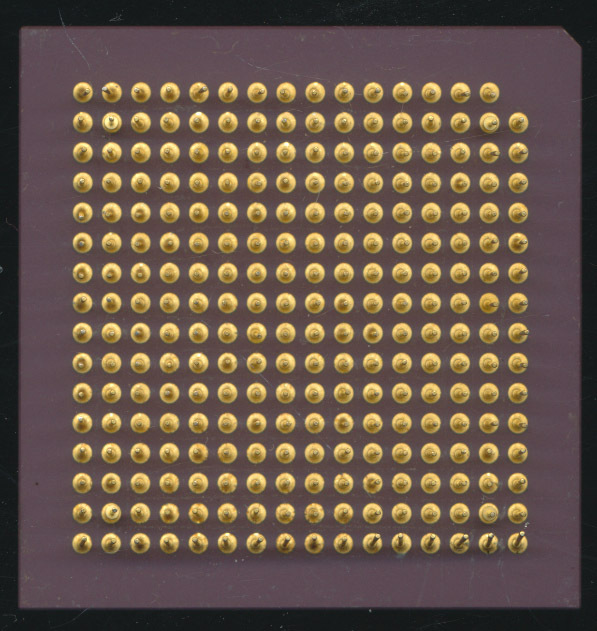 Chip Supply packaged this in a 16×16 CPGA package that is 50mmx50mm (nearly 2 inches square). 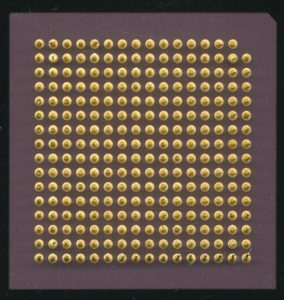 It includes a large, gold plated heatspreader thats about the same size as a typical BGA PowerPC 603e. 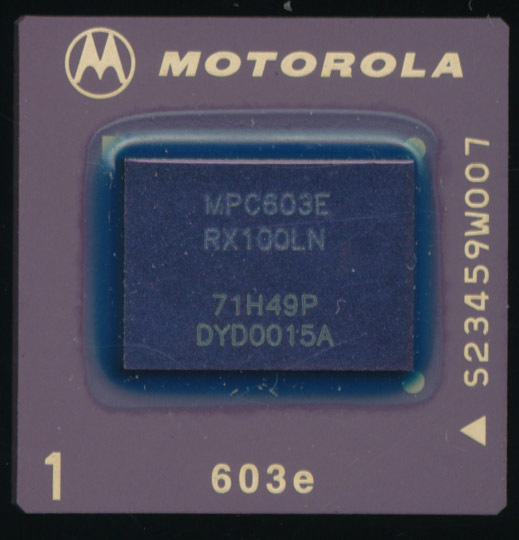 These use original Motorola dies, upcreened to Military temperature (-55-125C) and tested to run at 200MHz. The large heatspreader and ceramic package allow for better thermal management, and better mechanical support. Thermal cycling and vibrations often result in BGA connection failures (a familiar problem on some game consoles in the early 2000’s), something a properly mounted PGA chip is much more tolerant of. 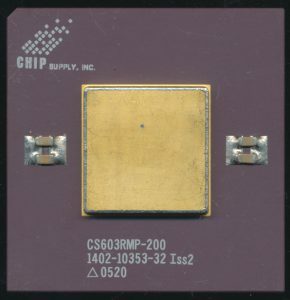 Chip Supply Inc. was acquired by Micross Components in 2010, a company that formed in 1998, and provided the same services with the addition of radiation testing. It appears that this was the end of the line for the entire PowerPC line by Chip Supply, though its likely that custom orders could be fulfilled for sometime after the acquisition. Someday perhaps we’ll find out what applications the PGA PowerPC 603s were used in.